View Cart “The American Agent aka Bob (RotD expansion)” has been added to your cart. 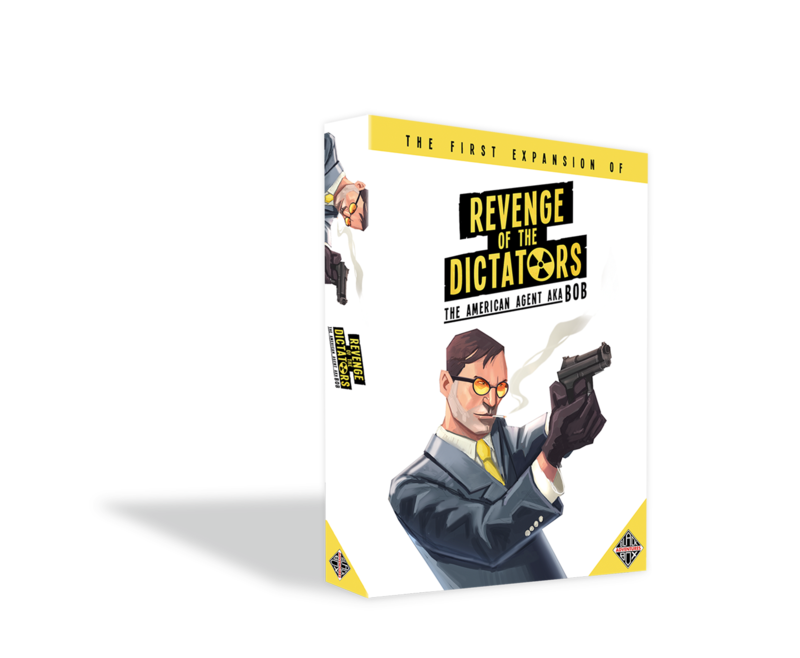 With Revenge of the Dictators: The American Agent aka Bob (the first expansion of Revenge of the Dictators), an additional player can play the role of Bob: an American Agent trying to stop the Dictators from taking over the world. The ultimate goal of the American agent is easy: make it to DEFCON 1 so the Dictators automatically lose (and you win the game). To do this, you need to try to spot as many Dictators as possible. Spotting a dictator gives the American agent certain tactical advantages, e.g., increasing the DEFCON level. 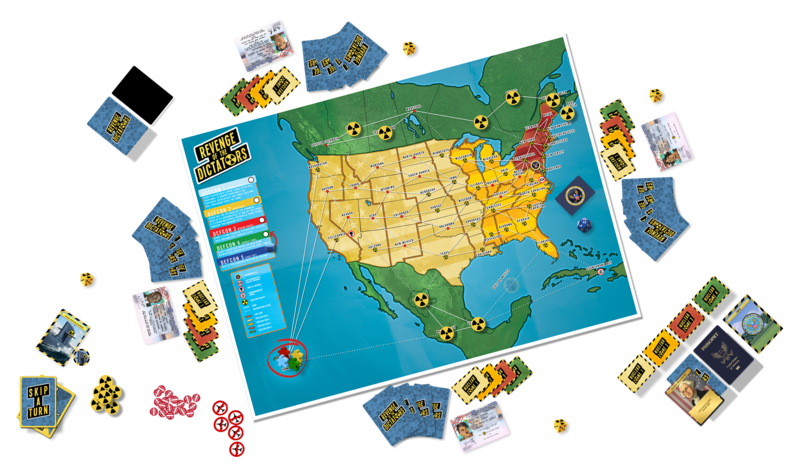 In addition the American agent can go undercover, which removes Bob’s meeple from the game board. Effectively this means the Dictators don’t know where Bob will move to next. Bob was just your average guy working a boring desk job for the American government. That is until he was contacted for a very special job. There are rumours of a few strange figures with plans of overthrowing the government and taking over the USA. Since the secret service already has to investigate too much of these conspiracy theories, they put their ‘best’ man on the job. But Bob takes this job very seriously! Bob’s task is to gather enough evidence for backing up these rumours, which increases the DEFCON level. With the help of some special technology he’ll make it very difficult for the Dictators to succeed. 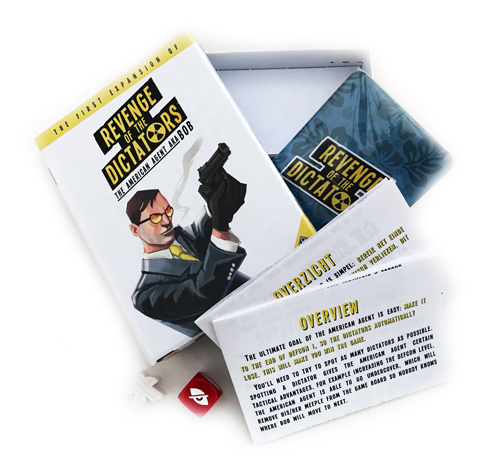 Revenge of the Dictators: The American Agent aka Bob comes with two hardcopy versions of our rulebook: an English and a Dutch version is included in the box. 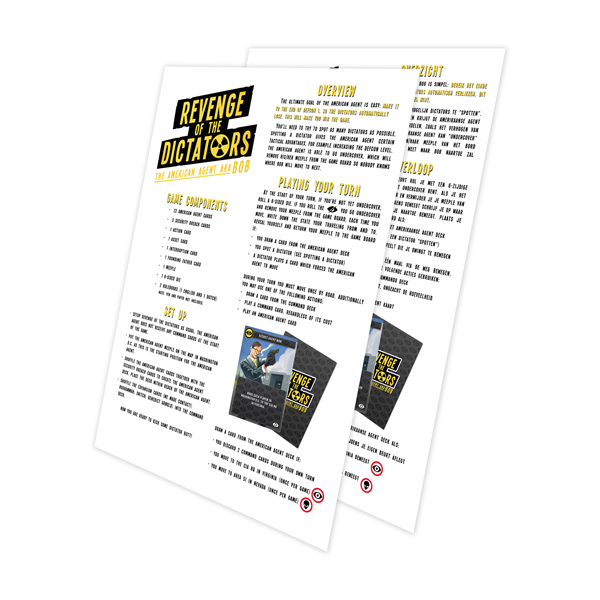 Should you want, you can download a PDF copy, or a rulebook in another language here.